Tyneside in England’s north-east has a revived centre for everyone in Newcastle and Gateshead, but its coastal edges are struggling, like Whitley Bay, or moving upscale like Tynemouth. It’s like Britain in miniature. Following my article on Goonhilly Earth Station in December, The Register has published the other piece I researched while visiting Cornwall last autumn: on how Guglielmo Marconi, an Italian working in Britain, transmitted a signal from Newfoundland to Cornwall and changed the world. The Second World War still looms large in Britain’s popular culture, in comedies and in documentaries about the Nazis. Germany has moved on; with most Britons now too young to remember, we need to do the same. 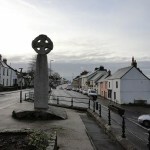 My latest article on Beacon focuses on three towns in nothern Cornwall: Bodmin, Padstow and Rock. Padstow and Rock have become known for their good food and the associated tourism that brings, through restaurants such as Rick Stein’s and Nathan Outlaw’s. Now, Bodmin wants to follow suit.